Chemical Constituents and Components : Main chemical componenets are guggulsterones E and Z, guggulsterol-I, II, III, cholesterol, sesamin and camphorene. Guggulsterones: 1. It significantly lowers total cholesterol, LDL cholesterol and triglycerids. 2. The combination of antioxidant and lipid lowering properties of guggulsterones make it especially beneficial against atherogenesis. 3. Guggulsterones Z&E stimulate thyroid production, increase triidothyronine (T3) levels and metabolic rate of the body, thus controlls obesity. 4. It stimulates the activity of white blood cells in the body, contributing to the build-up of the immune system. 5. It inhibits platelet aggregation and normalizes fibrinolytic activity. 6. These act as an immune stimulant by increasing leukocyte count and enhance phagocytosis. 7. It lowers serum markers of inflammations. Curing Diseases : 1. Guggulsterones are recommended for treatment of acne, diabetes and obesity. 2. 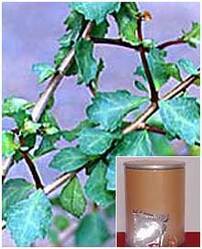 Guggul can be used in the treatment for impotence. 3. It has great effect in preventing heart attack, heart atherosclerosis or narrowing of the arteries.